Are you looking to start a new newsletter campaign and you are not a designer, then the newsletter are the perfect thing that you should have. For a perfect newsletter, you have to write a creative template that should have attractive words and designs that can seek the attention of potential consumers or viewers. It should be full of creative content and relevant images. For the same, template is the best thing that can reduce the workload and can save a lot of time and money. Don’t forget that the template should be reliable, attractive, professional and effective as well. 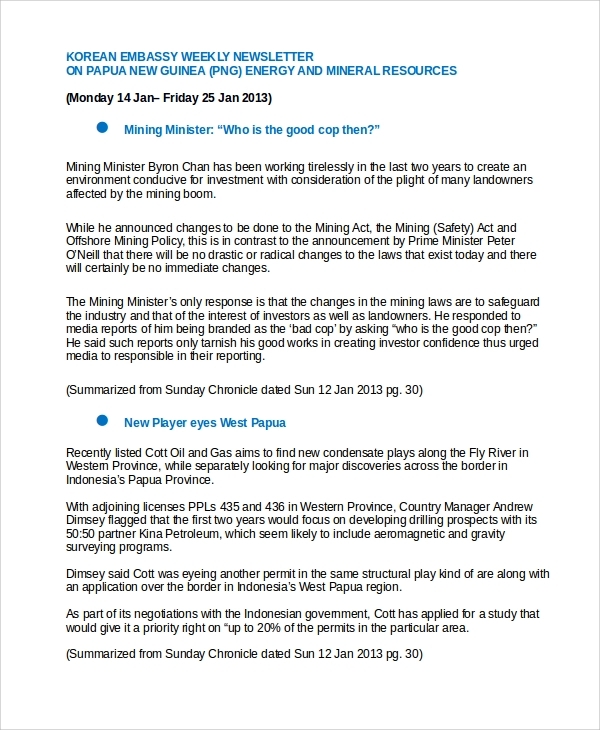 Weekly newsletter templates are coming out as a preferred choice for the most of the people. You can rely on it for the best outcome. 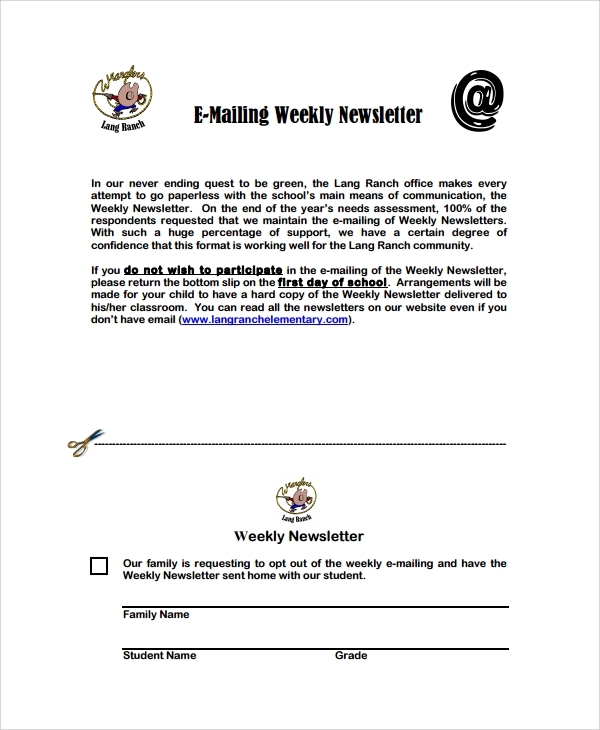 You can also see Family Newsletter Templates. A special template for kids. As the name suggests it works on a weekly basis. It looks attractive with beautiful pictures. It can help a lot in several things. All you need to do is fill it with relevant data. 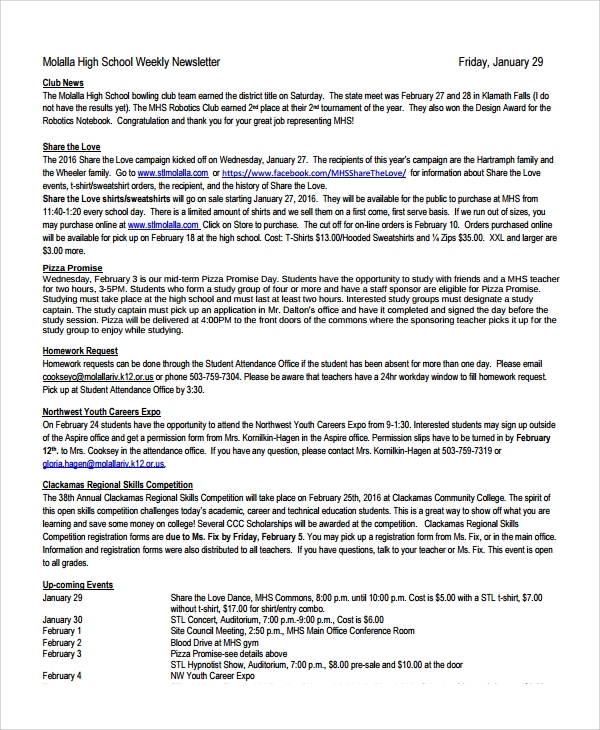 Under this form template you will get a place for the announcements. It is so big that you don’t need any other newsletter. 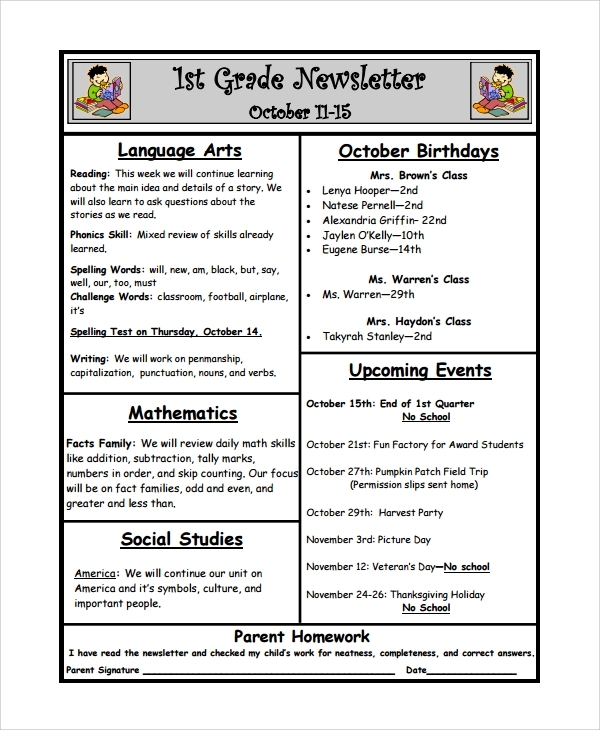 A newsletter that is beautifully designed for the kids of 1st grade. It is attractive and impressive, kids will surely love it. You can call it simple yet effective one that serves better results to you. Under this, you will get a place for each and every important thing like upcoming events, birthdays, space for adding holiday homework, a place for each subject, homework for parents and important notes and information for the parents. It is attractive that will raise the standard of your school among kids and parents as well. 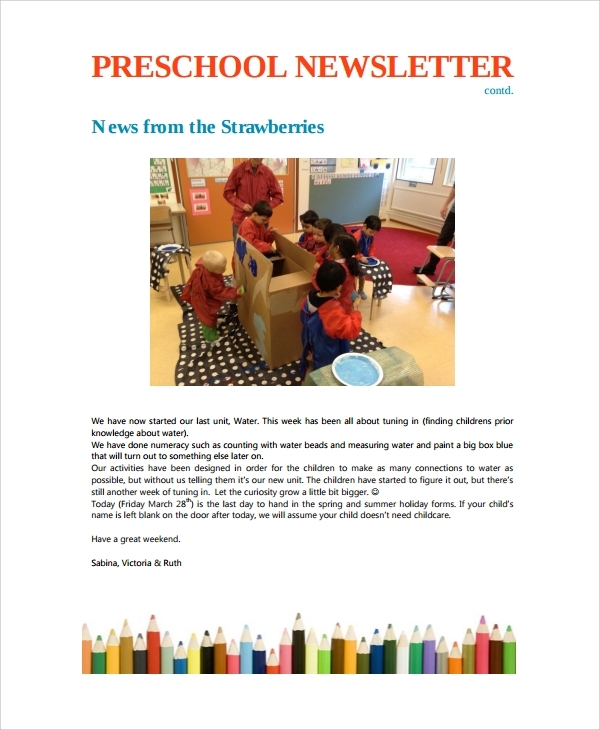 An amazing plus needful newsletter is the Preschool Weekly Newsletter. 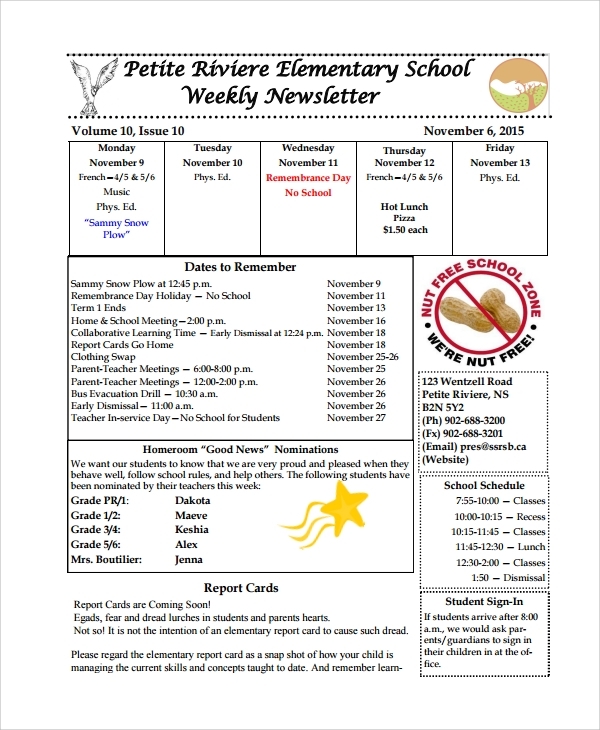 With the effective Preschool Weekly Newsletter Template, you can attract more students and new admissions as well. 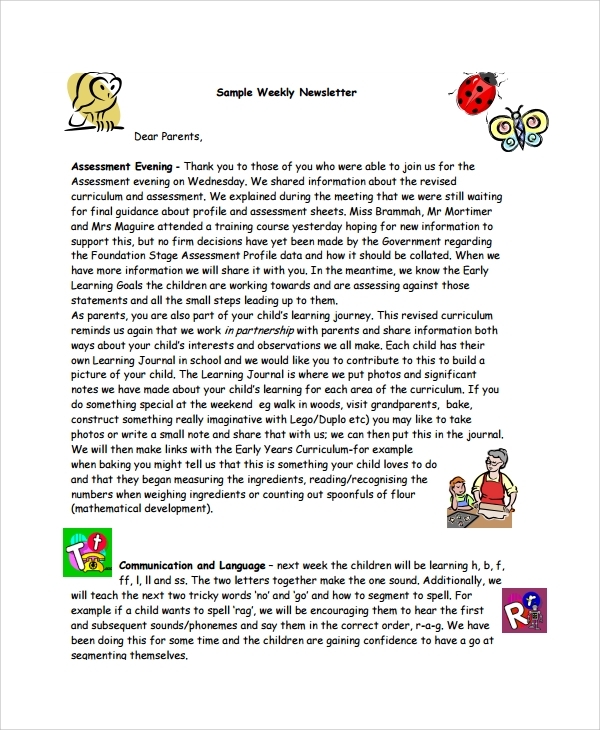 The newsletter is something that parents check and from it, they assume the status of the school as well. This template is specially designed for the preschool children and on the weekly basis. You should search for the one which is attractive and impressive as well. You should add each and every needful detail in it about the activities, useful information, news and several other things that parents should know. It is also an effective template that carries great importance. 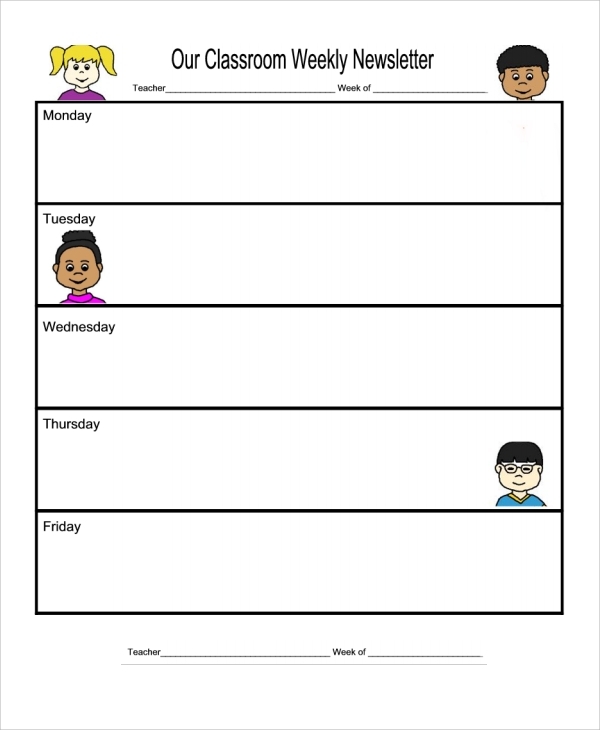 In this template, you will get space to mention activities on a weekly basis so that students should know what is up for tomorrow. Moving forward in the same you can mention special dates that they should remember, news, information about results, and changes that you have brought in the meantime just to improve the discipline of the school. 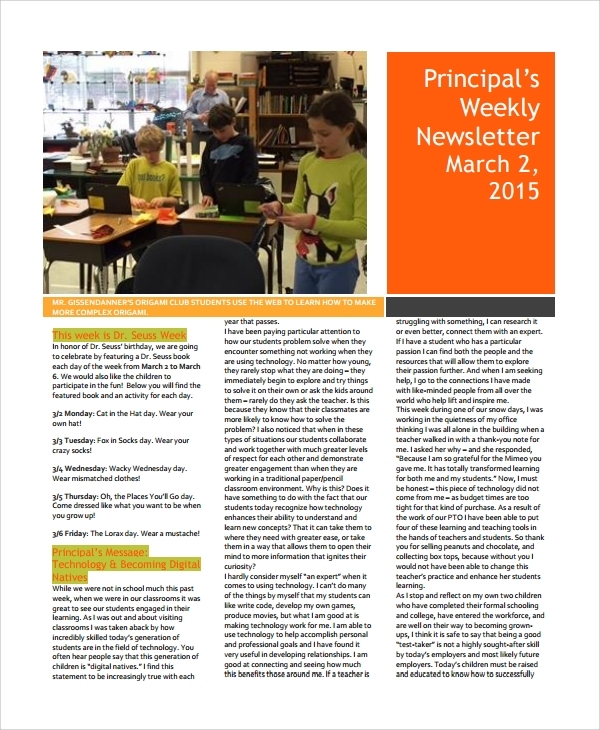 There are several advantages of school newsletter template. It helps you in showing the several activities and best things to you school. It keeps parents updated about the changes in school and its discipline as well. It should be attractive and impressive so that student will love it. It will help you in enhancing the level of school. While designing it, you should ay some attention towards the design and useful content that you are going to add in it. You can also see Company Newsletter Templates. 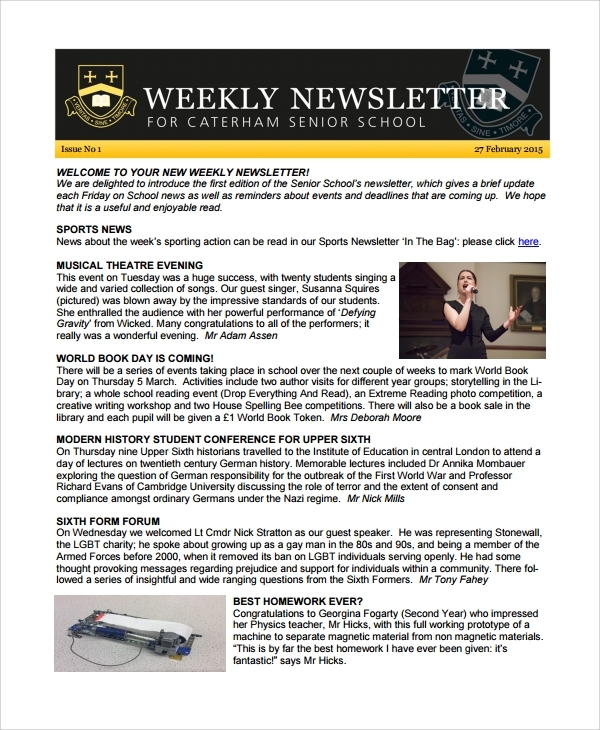 For better ideas you must check online free newsletter templates and school newsletter templates that can serve great results to you. Just download it for free on the internet.